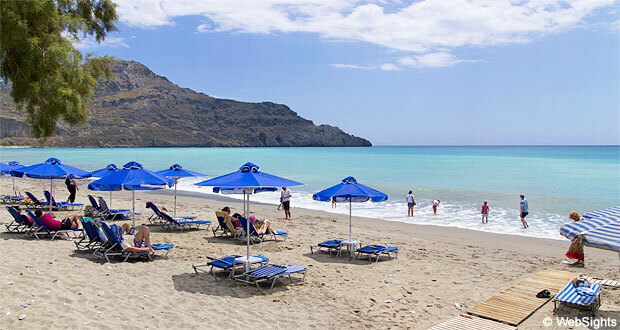 Plakias is a small holiday resort on the south coast of Crete, approx. 35 km south of Rethymnon. The town is situated at the end of a valley surrounded by mountains and rich olive groves. 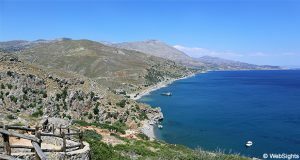 The main beach in Plakias starts in front of the town and continues for over one kilometre to the southeast. Here the beach ends abruptly due to the Kako Mouri mountain. The beach is mainly covered with sand, but there are also quite many pebbles along the beach. The water has a nice turquoise shade and even though there are often small waves, it is generally safe to go bathing. The beach has several sections where it is possible to rent sun lounges and sunshades. It also has changing facilities as well as showers and toilets. In the southeast end of the beach, the one farthest from the town, there has been an unofficial section for naturists for years. 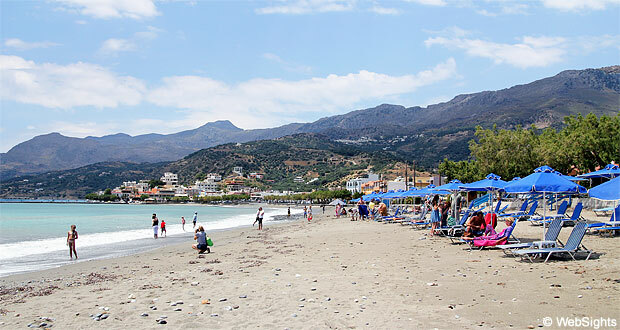 The beach in Plakias is big and there is usually enough room to play. It is usually also possible to find a place to play ball. If there are waves, it is important to keep an eye on the children when they go bathing. There are no water sports activities, but the snorkelling conditions along the rocks in the southeast end of the beach are good. However, you should be careful of the black sea urchins that may sit on the rocks. The beach is parallel to the main street of the town and the other side of the street has a fine selection of restaurants. 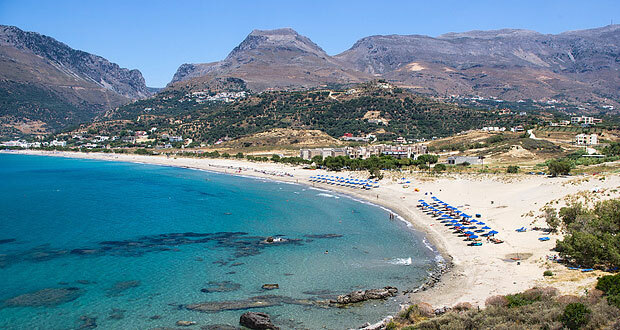 Plakias is a nice and relaxed holiday resort, which is neither too big nor too small. The town has the basic types of shops and supermarkets to accommodate the tourists. There is also a fine selection of cafés, restaurants and small bars. The hotels are mainly small and family-owned, but the Alianthos Garden Hotel is a nice and large hotel close to the beach. It is highly recommended and, according to the users on Tripadvisor, it is the best hotel in town. You will find some other nice beaches close to Plakias, such as Damnoni, Ammoudi and Shinaria a few kilometres to the East.